Though I may seem to spend all efforts on my face skincare regimen, I can assure you the rest of my body gets quite a bit of attention as well (no alligator skin here). While I may vary from hour to hour on my face skincare (I exaggerate so), the approach towards my body skincare regimen is a little less fickle. 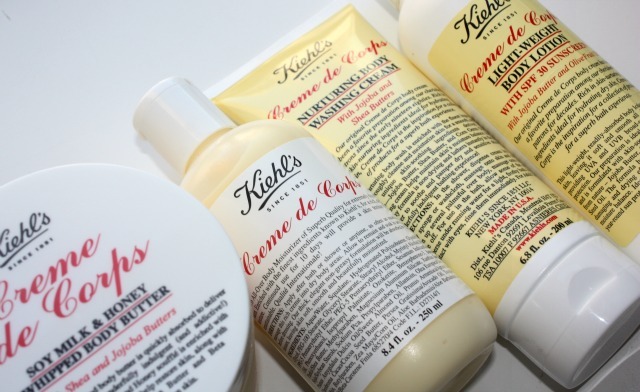 Kiehl's Creme de Corps has been a long standing holy grail product line for me - and just about every product in the line is better than the next. The cult classic for this line is definitely the standard body lotion and was the first product to get me hooked. People often touted it's ability to absorb immediately and hydrate skin instantly no matter how dry or irritated - and I have to give it up to those "people" - they were 100% right. It is the ONLY body cream I will travel with and while I may try out a million others, I always go back to Creme de Corps as my favorite. Even more exciting then finding the Creme de Corps was finding the Creme de Corps Lightweight Body Lotion SPF 30, since we know how much I strive to keep myself pale and pasty! Every single one of my face products from moisturizer to foundation has SPF so I am always covered, but when it comes to the rest of me - I am a sitting duck for all that awful sun damage. And while most body SPFs can be thick and sticky, this lotion couldn't be further from - light, easily absorbed and perfect for everyday. I would have been happy sticking to these to body lotions - but then Kiehl's had to go and launch their Soy Milk & Honey whipped body butter - and change. the. game. Whipped and luscious - while sounding like a delightful dessert - is in fact the texture of this lotion. Upon first use I was sure it would have to be stored at the back of my beauty closet for the coldest depths of winter, but once I applied - it was clear this was a year round cream - ANOTHER addition??? YES. Finally, supremely hydrated skin would not be complete without the first step - Nurturing Body Washing Cream - a body wash that will change the way you take a shower. And while not pictured above because I am currently out *tear*, is the Soy Milk & Honey body polish which if stranded on a desert island would be the only scrub I would bring. Come to think of it - the entire Creme de Corps line deserves the "only body products needed if stranded on a desert island" status. And you can quote me on that. Yes - and it is amazing!!!! ONe of the best I have ever used!